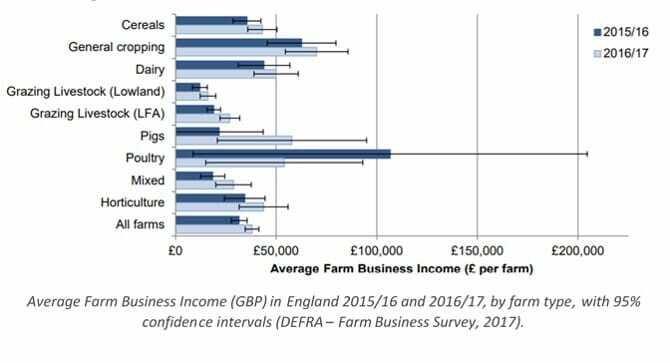 The survey results of Farm Business Income for 2016/17 were released by DEFRA on the 26th October as a further instalment of the initiative to monitor and evaluate Government and EU policies, and to inform wider research into the economic performance, productivity and competitiveness of the agricultural industry. The Farm Business Income report covers the 2016 harvest and includes the 2016 Basic Payment (which is included within total farm output and therefore contributes to Farm Business Income). Farms are differentiated by sector of production: cereals, general cropping, dairy, grazing livestock (lowland), grazing livestock (LFA), pigs, poultry, and mixed horticulture. • In 2016/17, average Farm Business Income increased across all farm types except for specialist poultry farms. A key driver was the exchange rate which led to firmer prices for a number of commodities as well as an increase in the value of the Basic Payment. • On lowland grazing livestock farms, a 33 percent increase in average incomes was driven by firmer beef prices, increased output from cropping and the Basic Payment. On LFA grazing livestock farms higher output from cattle together with an increase in the Basic Payment, led to a 42 percent increase in average income to £27,000. • Average agri-environment payments were lower in 2016/17 across all farm types apart from LFA Grazing Livestock. This reflects a decline in the number of agreements plus some payments still to be received at the end of the accounting period. • The average Basic Payment in 2016/17 was around £28,000, a 19 percent increase on the previous year due to the weaker pound at the end of September 2016. Estimates have been made for some farms where final payment details are not yet available. On specialist pig farms, average Farm Business Income more than doubled from £21,600 to £57,800. Pig prices firmed in the second half of 2016 supported by tighter supplies and the weaker pound. This had a positive impact on closing valuations. Despite this, pig enterprise output was lower, due to a reduced throughput. The reduced output was more than offset by a substantial fall in both fixed and variable costs, particularly feed, 6 and to a lesser extent labour. Note that this change may be the result of an increased proportion of farms contract rearing pigs within the sample. For these farms, some of the input costs are not paid by the farmer. For those farms that did not contract rear pigs, enterprise output increased by more than a quarter in 2016/17. There was one particularly influential farm in the sample. Removing this farm from the results would reduce average Farm Business Income to £39,500. A more detailed analysis of the results will be published on 14 December 2017 in Farm Accounts in England. Forecasts of income by farm type for the year ending February 2018 and covering the 2017 harvest will be published in February 2018. To view the full report for 2016/2017 so far, click here.